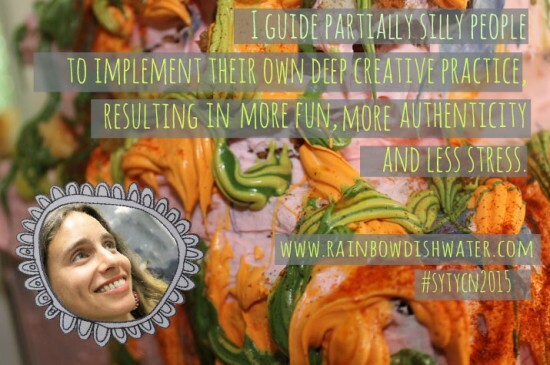 I guide partially silly people to implement their own deep creative practice, resulting in more fun, authenticity and less stress. 4. Right now this is a 4/10 for me. And yet I really love the vibe of it. The ‘who’ is ‘partially silly people’. I love that you’ve chosen your own name for a group – there’s a voice and originality here that draws me in and speaks of a unique point of view. And it’s still a bit fuzzy to me what you mean by that. I’m not clear if I’m in that group or not and I can’t immediately think of anyone else. The result you’re offering has to do with helping people implement their own deep creativity practice. My two concerns with this are that a) it’s not clear to me what that is exactly b) I wonder if anyone is really craving to have a deep creative practice or if it’s something you think people should want to have. The results this would offer people are ‘more fun, more authenticity and less stress’ which feel very broad and general to me. Nobody would say they don’t those things but very few would say they do – in those words. I find myself curious: who do your ideal people secretly envy and why? And what’s going on in their lives that would let them know it’s time to develop such a practice. Regardless, please keep bringing more fun, authenticity and creativity into this world. They are sorely needed. 7/10: This makes me super curious about what the deep creative practice is, but the partially silly throws me. Why only partially? Is it because they haven’t embraced their full silliness? The second line feels fuzzy to me. I would like to know more about that creative practice! The first line really appeals to me a lot though and immediately made me want to visit your website.I noted our paths are similar. Lovely to meet kindred spirits! 5/10:While I think there is some vagueness to “partially silly people,” I think this is a statement that people might self-identify with. It makes me smile and wonder if that might be me: waiting on the edge of silliness to make my full silly blossom. (I write this as I sit in a coffee shop whose soundtrack is making me dance in my chair, which is silly enough that my daughter would definitely try to suppress me if she were here!). On the other hand, I don’t know where these people might find each other and meet each other, what publications they might read, what they do for fun (watch clowns perform or take clowning classes?). Thinking about clowns, I wonder if these are people waiting to release their inner clown, loosening their tie / discarding their pantyhose / stripping off their stiff work uniform to have safe fun outside of their “real” life. I like where this is heading but I want a firmer starting place. 6/10: I love the idea of partially silly people, but I also don’t get it entirely. Is the result coming into their full creative silliness? Harnessing their silliness creatively? I feel like it could be clearer. I do love the general idea of it, at least by my interpretation, and I think it’s a very positive thing to offer. 7/10: Partially silly part made me laugh. I guess I’m not sure on what problem you are solving for people exactly through your service. 5/10: the idea is intriguing, but “partially silly”? Not really liking that.Why only partially? Feels a bit alienating to me. Though this is intriguing, it’s still a bit vague. 6/10: I might be partially silly, I’m not sure. Also not sure whether I’m not authentic, or not having fun, so it hasn’t really defined who your client is or what problem you’re best equipped to solve is. Would love to know what the background image is though! Thanks so much for your comments everybody. I’ve made a revised version, though it will probably be in progress for a lot longer than this. I guide silly people past self doubt and the limitations of their responsibilities, into their own fearless and committed creative practice.